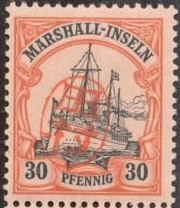 Postage stamp production was affected by war-time economies. 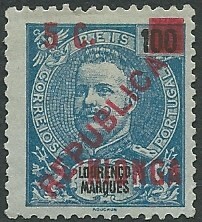 Printing was often of a lower quality, watermarks were less clear and yellowy or brownish gum replaced white. 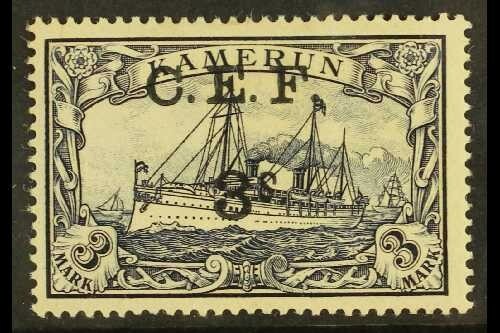 There were also forgeries made of some stamps for use by British intelligence agents in Germany. 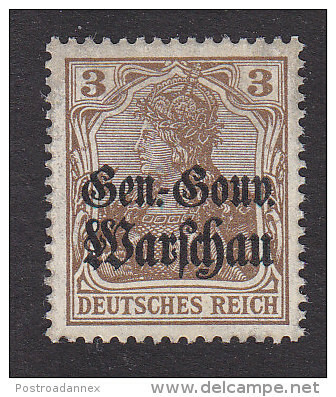 The occupation of foreign territories by Germany and occupation of Germany territory in 1918 by the victorious allies generated the need for a large number of special issues as foreign powers took over postal systems. 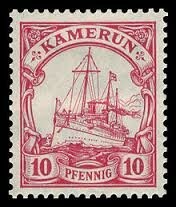 German forces had to provide postal services in a number of occupied areas: Belgium, the Russian Baltic Provinces, Poland and Rumania. The German army in the Baltic area made significant advances in 1915; they took the city of Vilnius and then occupied all of Courland and most of Livonia. During a new offensive in 1917 they took Riga and then, under the terms of the Brest-Litovsk Treaty occupied what were to become the three Baltic states of Estonia, Latvia and Lithuania. All of Russian Poland fell into German hands by the end of August 1915 and in 1916 Poland was named the 'General-Government, Warsaw.' In November of that year Germany and Austria proclaimed a 'Polish Kingdom.' Pilsudski resigned from the controlling Council of State and until the end of the war Poland was controlled by a Regency Council supervised by Germany. Rumania entered the war in August 1916. Despite early successes her army was overwhelmed and by 1917 much of the country was in German, Austro-Hungarian or Bulgarian control. M.V.i.R. was the abbreviation for Militaeverwaltung in Rumanien (Military Administration in Rumania). 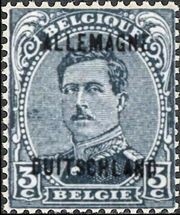 Belgian stamps overprinted 'Allemagne Duitschland' were issued for Belgian forces in the Rhineland and used until April 1931. 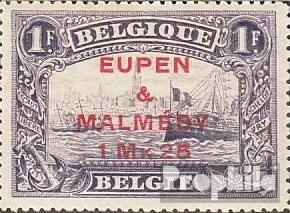 Stamps of Belgium were used in the districts of Eupen and Malmedy. Unlike other areas of Germany, no popular vote was held in these districts. In fact there was a policy of intimidation and voters who wished the territory to remain part of Germany were required to sign a public register. There was the fear that those who signed would lose the right of Belgian citizenship or be deprived of food coupons. Few signed and in September 1920 the League of Nations placed the territory under Belgian sovereignty. 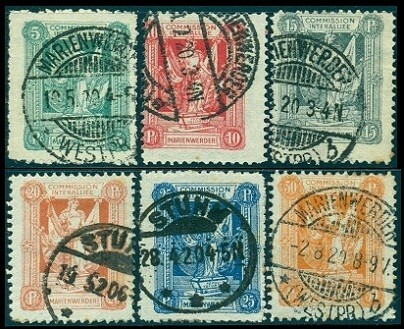 Other former German territories in the east were subject to plebiscites or other status changes after the war. 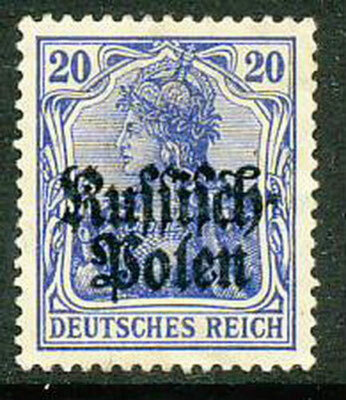 In July 1920 a popular vote was held in Allenstein, part of East Prussia. There was a vote of 90% in favour of remaining in Germany. The district was occupied by Soviet troops in 1945 and has been administered by Poland under the name Olsztyn since. 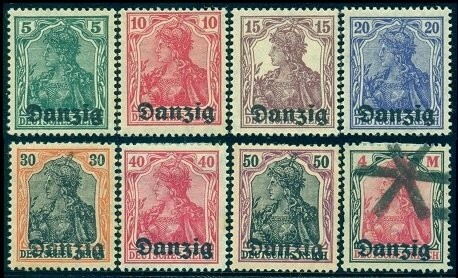 Under the Treat of Versailles in June 1919 Danzig was designated a Free City. It remained as such until 1939 when German forces occupied Poland. Marienwerder, a district of West Prussia, was subject to a plebiscite on whether it should remain German or become part of Poland. 92% voted in favour of staying German which it remained until 1945 when it became Polish with the name of Kwidzyn. At the end of the war Germany surrendered the city of Memel, on the Baltic coast of Lithuania. Under the terms of the Treaty of Versailles France was granted administration. 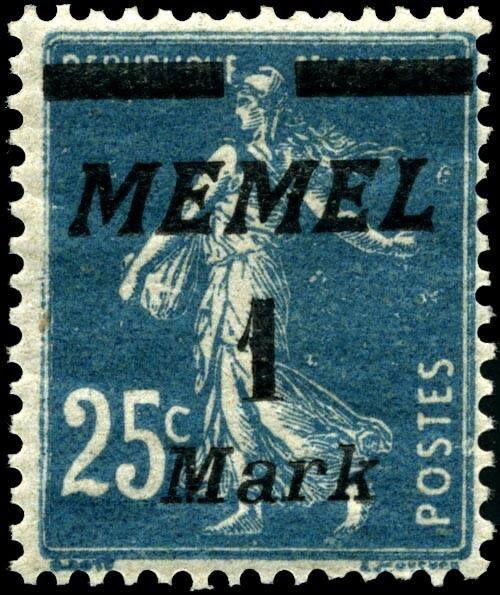 In 1923 the town was seized by Lithuanian forces and the French were ordered to withdraw. 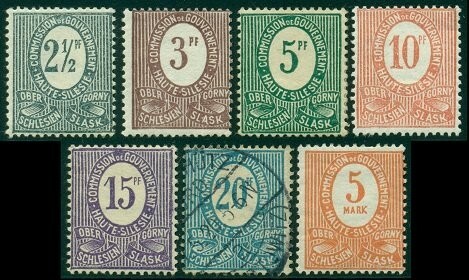 According to the Treaty of Versailles, the Saar district of Germany was place under the administration of the League of Nations for 15 years, at the end of which there was to be a plebiscite. 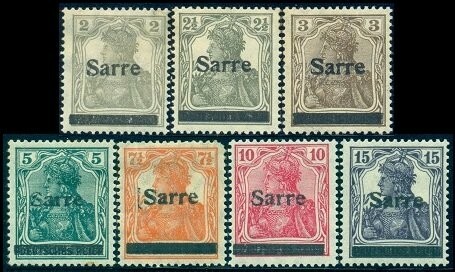 During this time France assumed ownership of coal mines in the Saar. Saarland was finally returned to Germany in 1957. Schleswig was divided into two zones for separate plebiscites. In Zone 1 75% of voters were in favour of inclusion within Denmark whilst in Zone 2 80% voted to remain in Germany. 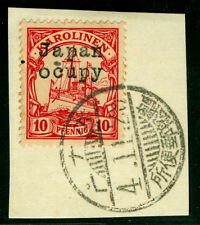 Zone 1 was incorporated into Denmark in July 1920. 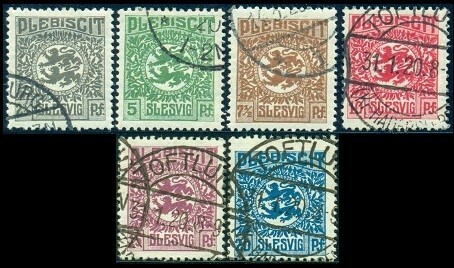 Upper Silesia was subject to a plebiscite in March 1921. The area was then divided between Germany and Poland. 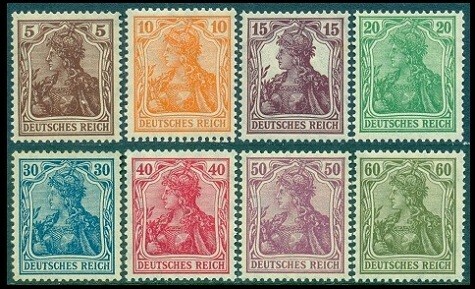 Numerous territories overseas that had been governed by Germany were occupied by the Allies at the outbreak of war. 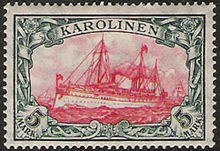 Stamps for the majority of these colonies were based on the 'Yacht' key types. 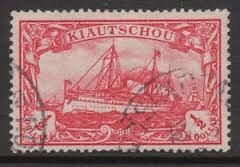 This was the Kaiser's yacht Hohenzollern. 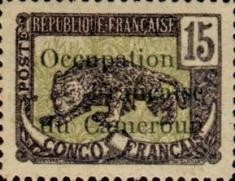 Cameroun: this territory was occupied by British and French forces. In March 1916 it was divided between the two countries with the British gaining a strip of land along the Nigerian border. This arrangement was recognised by the peace settlement of 1919. Caroline Islands: these islands were occupied by Japan from October 1914 and in 1920 became Japanese mandated territory. After WWII the islands became a U.S. trust territory. 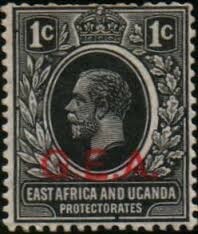 German East Africa: in contrast to other colonial territories, a prolonged campaign took place in East Africa. German forces even invaded Rhodesia and the German commander only surrendered on 14th November 1918. in 1920 the U.K. was given a mandate to govern the former German territories with the exception of Ruanda-Urundi which was given to Belgium, and Kionga, which was given to Portugal. 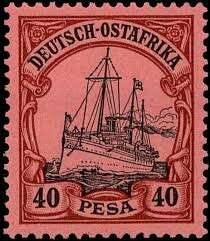 Because of the war, sticks of German stamps became depleted and handstamping was used. 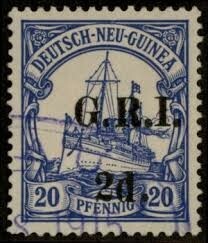 Unoverprinted 'Germania' stamps were also salvaged from German ships and some emergency printing took place. 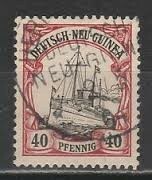 German New Guinea: Australian forces took control of New Pomerania in September 1914 and in 1920 Australia was given a mandate to administer the territory. German South-West Africa: after a rebellion in South Africa, aided by arms supplied from German South-West Africa, had been crushed in December 1914, South African troops invaded the protectorate and the German forces surrendered in July 1915. A mandate to govern the region was given to the U.K. in 1920 to be exercised by South Africa. Kiaochow: this area included the city of Tsingtao (Qingdao). It surrendered to Japanese forces in November 1914. The Japanese then occupied much of Shandong province which was not retuned to China until after the Washington Disarmament Conference of 1921-22. 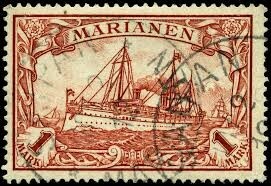 Mariana Islands: these islands were occupied by Japan in October 1914 and were made a Japanese mandated territory in 1920. In 1947 they were made a U.S. trust territory. Marshall Islands: these islands were occupied by the Japanese in September 1914 with the exception of Nauru which fell to the Australians in November the same year. 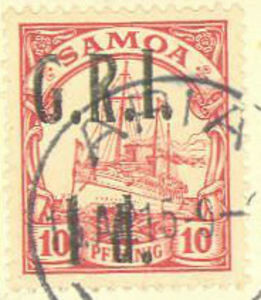 Samoa: in August 1914 New Zealand forces occupied these islands and in 1920 New Zealand was awarded the mandate to govern the territory. Togo: French troops from Dahomey and British from Gold Coast invaded Togo in August 1914 and by the end of the month German forces had surrendered. 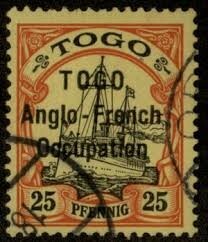 Until 1919 Togo was under Anglo-French occupation.